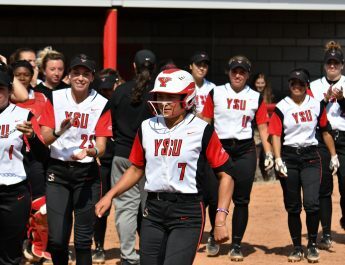 For Miranda Castiglione, a volunteer assistant for the Youngstown State University Softball team and graduate student in criminal justice, being a leader was something embedded in her mentality from day one. From her playing time for YSU and her now second year as a volunteer assistant, she’s kept that mindset. Growing up in Ontario, Castiglione learned early on that softball wasn’t a sport with the same stature as in the United States. Castiglione credits her time playing for the Junior Canadian National team along with her then soon to be assistant coach at YSU Tiffany Patterson, who is also a fellow Canadian. For her, being able to make it stateside was tough. Despite seeing minimal action as a freshman in 2013, what opportunities Castiglione did get her first year helped see her role change come sophomore year. Her 2014 season would be a breakout year. Castiglione won Horizon League Co-Player of the Year and All-Horizon First-team honors. From there, her career trajectory would only rise as she was given back-to-back first team honors en route to being unanimously voted team captain in 2016. An honor that hadn’t been given to a lone YSU softball player since 2008. Off the field, she had success in the classroom having accumulated a 3.6 GPA. She was a five-time Horizon League Academic Honor Roll selection. Castiglione always carried herself with the idea that both student and athlete in the term student-athlete were equally important. When Castiglione got the opportunity to be a volunteer coach through her assistanship program in criminal justice, it was just another test of her leadership qualities. Her first year saw her helping oversee some of the same players that she had previously grinded with throughout a season. Castiglione noted that it was difficult at first making the adjustment to coaching her peers but it would be a learning experience for both sides. She credits that experience as being what helped her to gain the respect of her athletes and bridge any gaps. “For me, it’s about always understanding before judging a situation,” Castiglione said. Being able to relate was key to her coaching experience. Working from the other side has since helped her as she says she’s learned more about the game coaching than she did as a former player. The future for Castiglione sees her straying from the world of softball and her five-year goal sees her putting her criminal justice background to use. She’s looked into potentially getting into federal parole and currently has an internship at the Adult Parole Authority here in Youngstown. Castiglione sees it as an opportunity to help offer a second chance to people that need it. Despite the differences between the two worlds, Castiglione still finds there’s a commonality between athletics and criminal justice stating that both hold you accountable for your actions.